Review of Natural Crystal Deodorant - It Works Great for Me! Review of Natural Crystal Deodorant – It Works Great for Me! After having used conventional deodorant / antiperspirants for around 10 years, I became concerned about the aluminum compounds they contained. Mainstream deodorant formulas contain aluminum chlorohydrate or aluminum zirconium as active ingredients. Studies have shown that aluminum molecules are absorbed by your body from these deodorant formulas. Aluminum is a powerful free radical that can cause cumulative damage to your body. Links between aluminum in the body and occurrences of health issues such as Alzheimers disease and cancer made me weary of my conventional deodorant. I began searching for a natural deodorant alternative. I tried several natural brands of deodorant, but I like my natural crystal deodorant the best. Made of potassium alum mineral salts, the aluminum-free all-natural crystal works to create an inhospitable environment for odor-causing bacteria. The crystal will not stop your body from the natural process of perspiring, but will eliminate the odor that accompanies it. 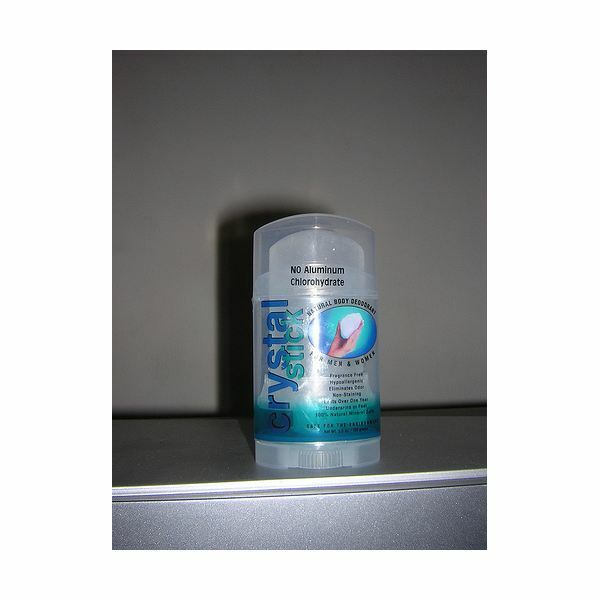 Many companies offer crystal deodorant, either in solid rock, spray, or roll-on form. Look for products from Crystal, Thai Crystal, L’Occitane, and more. I have the solid crystal version of the deodorant, which needs to be moistened with water before applying or applied to wet skin. I generally follow the suggestion on the packaging that recommends to apply the deodorant immediately after a shower before odor-causing bacteria have a chance to form. Overall, I have had great results using the natural crystal deodorant. I noticed that when I first made a switch from conventional deodorant / antiperspirants that the crystal didn’t seem to be working. However, I kept it up and noticed that I had fewer problems with odor after continued use. Antiperspirant ingredients in conventional products plug your sweat glands to keep you from perspiring. I suspect that my sweat glands were getting rid of what had been plugged for all those years! I highly recommend the natural crystal deodorant for those seeking a natural aluminum-free alternative to conventional deodorants. It has performed better than other natural-brand deodorants that I have tried.